Fast answers to Windows 10 questions Steps for customizing your Windows 10 PC Tips for solving common Windows problems Covers using Windows 10 on a tablet If you're new to Windows or upgrading to its new operating system, grab this book to get to know Windows 10 a little better. 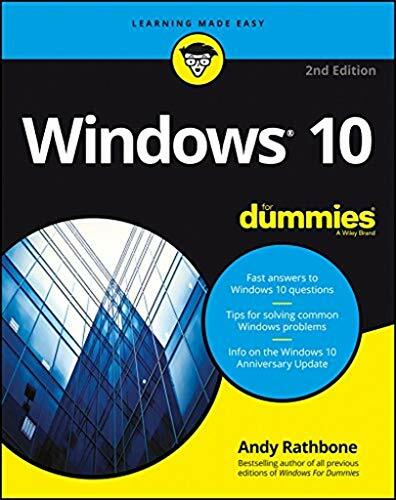 Get productive with Windows 10 Windows 10 For Dummies is the all-time bestselling computer how-to book and it's been fully updated for the enhancements coming with the Windows 10 Anniversary Update! Free of confusing jargon and packed with lots of helpful step-by-step explanations, it quickly gets you started with exploring the Start menu, storing files on the Cloud, creating desktop shortcuts, connecting to a printer, using Windows social apps, organizing digital photos, interpreting error messages, and so much more. Windows 10 keeps your PC or tablet running, organizes your files, and provides a platform to run your important applications. In short, it's the brain and heart of your computer. The simple steps and friendly advice inside help you manage files and applications, connect to the Internet, customize your Windows experience, and make repairs when things go haywire. Fast answers to Windows 10 questions Steps for customizing your Windows 10 PC Tips for solving common Windows problems Covers using Windows 10 on a tablet If you're new to Windows or upgrading to its new operating system, grab this book to get to know Windows 10 a little better.